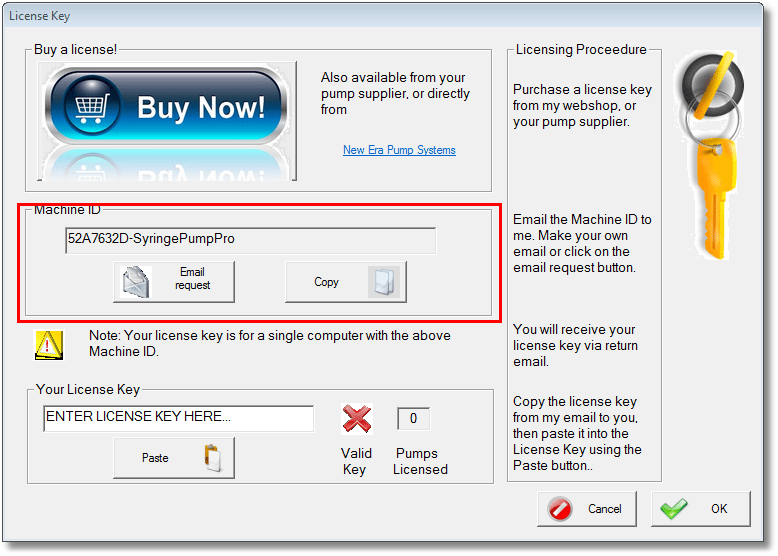 This page will show you how to download, install and license your copy of SyringePumpPro. If your trying SyringePumpPro you can skip the licensing instructions. Install SyringePumpPro on the computer to be used with your pump(s) connected. See our installation guide. Your purchase is for one license key assigned to the computer you nominate. Hardware and operating system changes will invalidate your license key. Make any changes to your computer before requesting your license key. License keys cannot be moved to another MachineID. An email window will appear. Fill in your name and company/institution details, your agent’s name and the order number in the first lines of this email. If your email software is not configured on the computer you are using, copy the MachineID from the box and send your machine id using our contact page. Don’t forget to include the your name and company/institution details, and your agent’s name, order number and order date. Copy the license key from your email program – watch out for leading and trailing spaces. Paste/type your license key as shown below. When your license key is entered correctly, a green tick will replace the red X in the Valid Key box, the number of licensed pumps will be indicated.